The Gwarsha Gate, since 2012 the black-banner daubed symbol of Ansar Al-Sharia’s presence in Benghazi, was taken by today by the army. 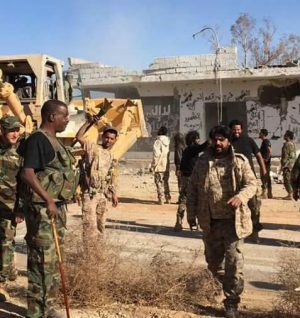 Victorious troops from the Saiqa Special forces and 298 Brigade promptly demolished the battered structure with a bulldozer on orders from Saiqa commander Wanis Bukhamada. The gate has been fought over for two years, with the army occupying it briefly in October 2014. This August a compound nearby was the scene of a devastating terrorist truck bombing which killed or wounded over 100 soldiers. Apart from this signal success, there has been little information coming out of the army today. Social media bloggers have toned down their coverage of the fighting following army fury at the overnight leaking of yesterday’s dawn attack on Ganfouda. There have been at least five air strikes on terrorist positions and regular artillery bombardment. No casualty figures have yet been given by the military. However, the Benghazi Revolutionaries’ Shoura Council said that three members of its Omar Mukhtar brigade had died in recent Ganfouda fighting.